Muse has a reputation for coming up with interesting music videos. The band's videos are almost as mind-bending and mysterious as their music. But which Muse videos are the most memorable? Watch Muse's 5 best music videos by clicking the links below, then get tickets to see Muse live here at AXS. Released just a few months ago, Muse's video for "Something Human" is beautiful. It has intense colors like the deep blue of a night sky and the deep red of an expensive sports car. Those colors plus the sharp, almost comic-book like style of the video make it look more like a movie. It would be a great video just to watch the visuals roll by. But then there's a good story in there, too, with the narrator going on an entire adventure that includes a car chase, a rocket launcher, and the last video store in the world. There is an awful lot happening in this video and that makes it even better than the song. 4. "Time Is Running Out"
Muse decided to take the title of their song literally in their "Time Is Running Out" video. The setting is a military bunker-type room similar to the one seen in movies like "Dr. Strangelove." The room is filled with actors playing military officers, who are clearly in crisis mode. But what does this have to do with the song? Muse are playing it right in the middle of all this. They're literally on the table surrounded by soldiers at one point. Choosing this bleak, pre-apocalyptic premise makes the audience feel that time is running out around them. And it's also cool to watch Muse playing on a table. The video for "Madness" is another Muse video that is visually different. None of it is filmed normally. Instead, the entire video is depicted in various shades of blue, green and pink. Two characters (played by models Erin Wasson and Max Silberman) move throughout a train station. They ride the train. They're wandering around on the train platform. Sometimes they're together. Sometimes they're not. It's intentionally vague and forces the audience to make up their own story. That could drive some viewers a little bit mad - but then plays into the theme of the song, so it works out. "Uprising" is another video where Muse spells out exactly what the song is about. Maybe it's what happened after the "Time Is Running Out" video? Anyway, viewers are treated to a post-apocalyptic world this time. Everything is black and grey. Storefronts have been smashed. Buildings are piles of rubble. It's a very sad place (even as you wonder what happened to make it that way). "Uprising" is meant to be a big anthem about standing up for yourself and that's what the video shows. This world has been crushed and then in the middle of it are Muse, urging people to rise up, which they do by starting a giant fire. Muse's video for "Pressure" is interesting because it guest stars actor Terry Crews from "Brooklyn Nine-Nine." That would make it interesting on its own but the premise of the video is that Crews is fighting aliens who are invading Earth. Not even Terry Crews can defeat an alien invasion by himself, though. 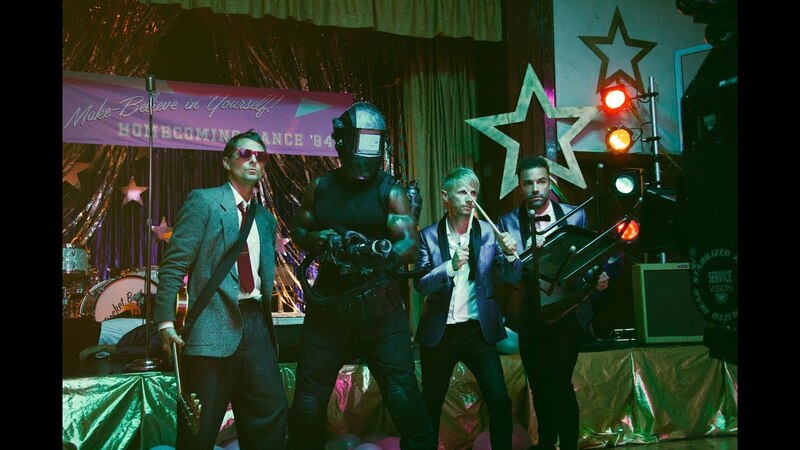 So the members of Muse jump in to help, even though all they have are their instruments because they were in the middle of playing a high school dance. The concept of the video makes the audience root for Muse as action heroes. Plus, a high school gym is literally destroyed for added entertainment value. Watch "Pressure' by playing the video at the top of this article and see if you think it's Muse's best video. For more on Muse, including tickets to their upcoming concerts, visit their band page on AXS.